After arriving in Berlin two days ago and slowly getting over the jet-lag, I finally found a free minute to kick-off another series of recap posts. This time I will catch up with events in reverse order as latest memories are still fresh and present. 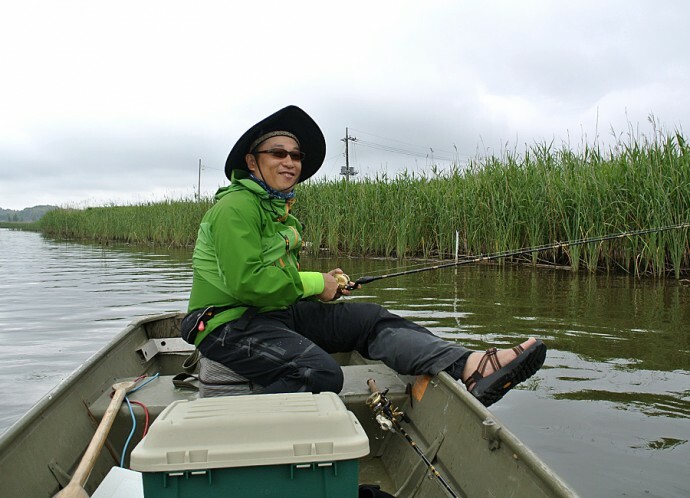 After visiting Muneaki Hayashi at the famous Slowtaper shop during the first days of the trip, he kindly invited us to an early morning fishing trip to lake Inba – located in the north of Chiba prefecture. Weather conditions where tough. 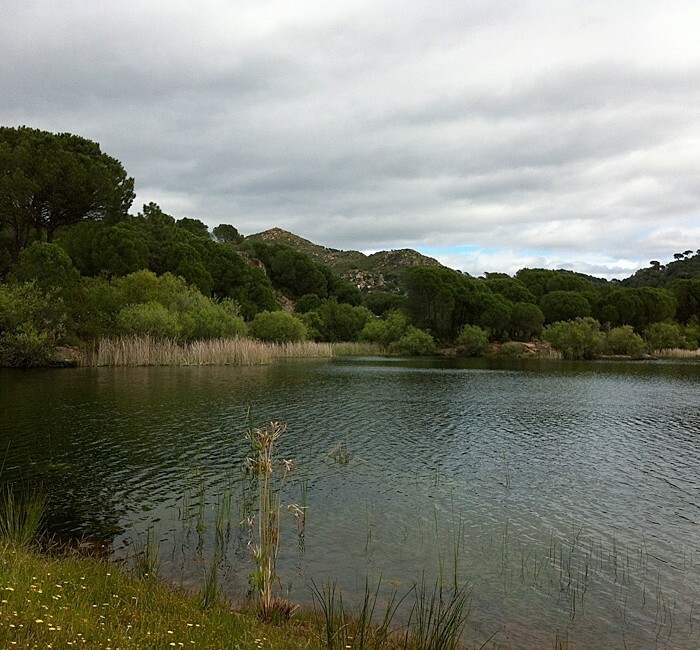 On June 17 we started fishing around 5:30 am with heavy rain and shifting wind. Despite all the odds, we enjoyed the time on the water and surprisingly even communication worked quite well. 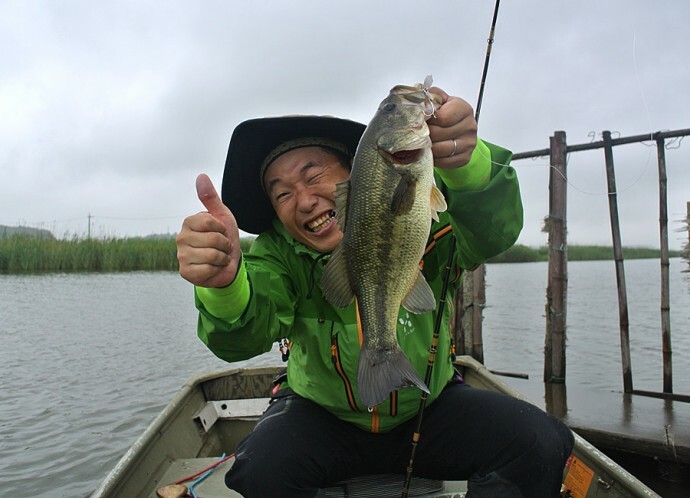 Hayashi-san barely speaks english but enjoying topwater style fishing together is still the best language and a perfect way to get to know each other. We shared a few bites, but the only fish of the trip was caught by Hayashi-san using one of the highly unique and quirky A.H.P.L. 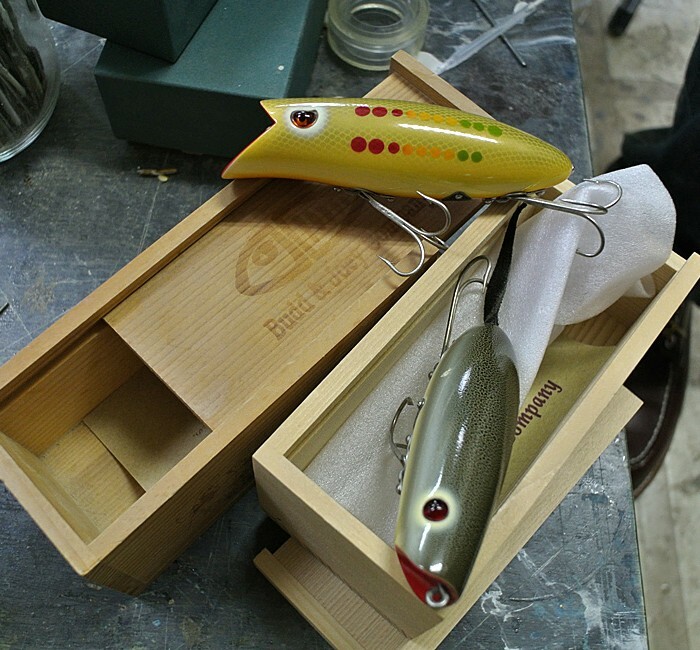 lures in his box. The mid-sized bass was caught close to a small floating jetty and after a short fight we had a brief but entertaining photo shooting. 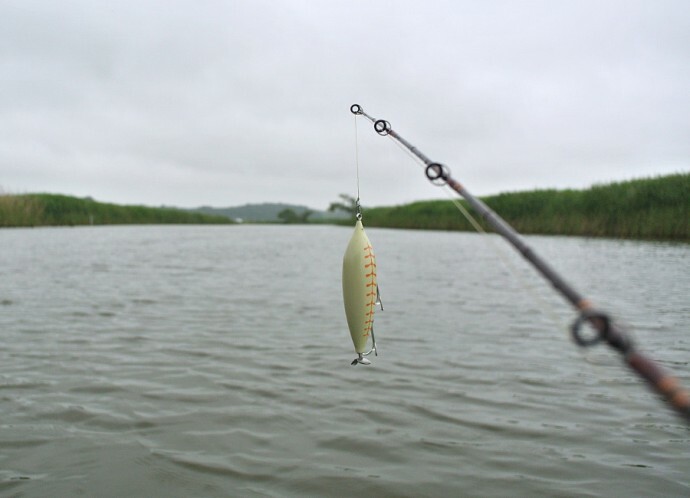 My lure of choice for the day was Local Lure’s “KariKari Mouse” – a lively moving single-swisher with a remarkable and irresistible sound. All bites of the day I had on this great lure and even if I was still struggling to adapt to the new rod setup, I really enjoyed the thrilling strikes. While visiting the Slowtaper shop the week before, I just couldn’t resist and bought Slowtaper’s own Distill GL58 rod and burl handle. I’m more than happy I got this beautiful and classy rod & grip setup, even if I have to admit that it took some time to adapt to the slightly longer and full-carbon rod blank. Overall we shared some enjoyable and exciting moments on and off the water and I hope we can meet again sometime soon. Thanks for taking me out fishing and for an insightful and inspiring topwater lesson.